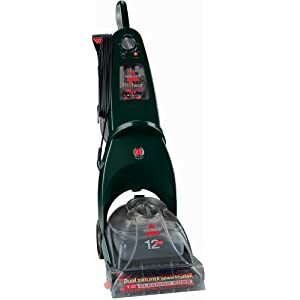 Hoover built the SteamVac Spin Scrub TurboPower carpet cleaner to offer an economical, yet functional, option to consumers. The unit manages 12 AMPs of power that move five rotating brushes that offer a deep down clean on almost any type of carpeting. The SteamVac Spin Scrub is equipped with two separate water tanks and a quick release latch to remove them for water refills and emptying. The easy use latch is a great design choice that can reduce the amount of time needed to prep the machine for another run. Hoover backs its SteamVac Spin Scrub carpet cleaner with a one year limited warranty. The Clean Surge and direct heat features help remove stains in heavily trafficked areas in the home. A Spin Scrub powered hand tool is included to make cleaning stairs and upholstery much easier without lifting the entire carpet cleaner. 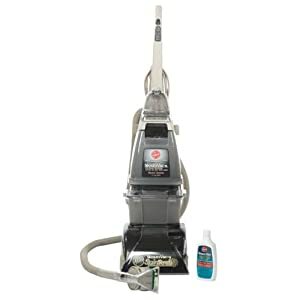 The SteamVac Spin Scrub carpet cleaner can handle three vital steps to remove stains and floor debris. First it applies hot water and cleaning solution to soak stains, then it scrubs carpet fibers and finally rinses with clean water. The SteamVac Spin Scrub takes hot air generated by the motor and blows it onto carpeting to add an element of heat to the cleaning process. 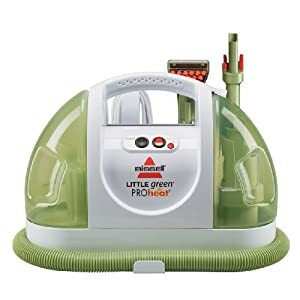 It does not heat the water in the tank, but this design is a step up from carpet cleaners that offer no heating function at all. 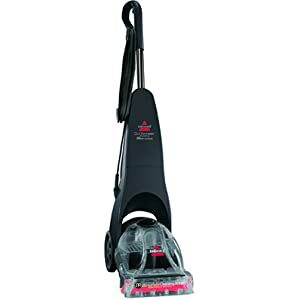 What did customers who bought Hoover’s SteamVac Spin Scrub TurboPower carpet cleaner like? The cleaning power is a big draw to the SteamVac. The five scrub brushes also help fluff carpeting during the cleaning process. Requires minimal time to work out tough stains, including many difficult to get out substances such as juice. 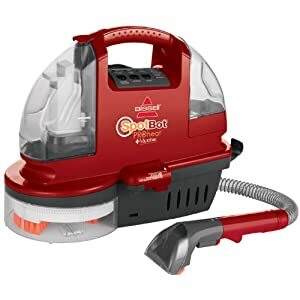 The price is economical for the amount of cleaning power offered by the SteamVac Spin Scrub, especially when compared to higher end Hoover models. Filling and emptying the water tanks is very easy and takes minimal time. What did cHoover’s SteamVac Spin Scrub TurboPower carpet cleaner ustomers dislike? The SteamVac does not actually heat water and create steam on its own. Hot tap water must be put in (boiling water is not recommended). The design includes numerous small compartments and spaces that can hold sediment and old, dirty water that generates an unpleasant odor over time if not completely cleaned. Debris, such as pet hair, must be removed if it begins to accumulate in the front compartment of the cleaner or it will not work properly. Steam Cleaners are not vacuum cleaners. You will need to vacuum your carpet as usual, but where carpet cleaners come in is to actually wash the carpet fibres in your carpet. This can give your carpets a new look and feel, though that obviously depends on the state of your carpets in the first place. Some Steam Cleaners may not actually use steam to clean the carpets. What seems to be a common mechanism is that hot water and detergent are applied to the carpet, and then brushes might be involved in agitating the carpets to clean the fibres. Hot air is then often forced down into the carpet to help efficient cleaning. The dirty water is sucked back up into the carpet cleaner, and hot air used again to dry the carpets. When you use a carpet cleaner, be aware that your carpet may require a few hours to dry before you can walk on it. However the results speak for themselves, with dirty carpets coming up as new. 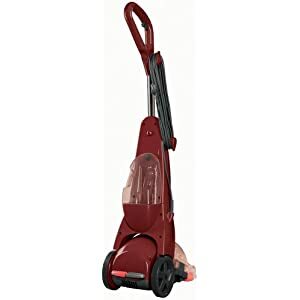 The Hoover Steam Vac with clean surge is a vacuum cleaner with a difference. Imagine being able to steam clean your own carpets, upholstery and bare floor boards? Deep cleaning using hot tap water and carpet solution. 5 spinning brushes to lift the dirt and clean the carpets, upholstery and even bare floor boards. Two water tanks used to keep the dirty water separate from the clean water. Clean Surge will give you an extra burst of cleaning solution when the carpet or unholstery is particularly dirty or stained. Brush rotation indicator so that you know when the brushes are rotating. 8 foot hose useful for cleaning stairs and upholstery with the stair/upholstery nozzle. There is a convenient trigger on the handle of the SteamVac that releases the cleaning fluid. Once you have finished cleaning your carpets, you release the trigger and the Hoover SteamVac pushes hot air. 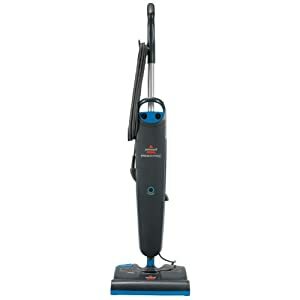 The Hoover SteamVac is a very popular floor cleaner although calling it a Steam Vac is a bit misleading. On Amazon over 1000 people have reviewed this machine, awarding it an average of over 4 out of 5. 67% of those who wrote a review awarded the Steam Vac 5 out of 5, and overall the machine averaged well over 4 out of 5. Cleans carpets exceptionally well. What more can you say? Dirty water container fills up too quickly. Slower than a pro machine, but then you get what you pay for.